Tales of Lemma 1 is the first game in a series of visual ren'ai short stories. 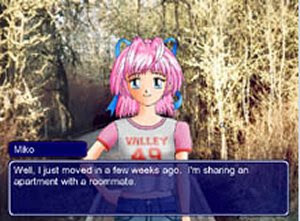 The star is a cute young 19-year-old woman named Miko, with whom the player gets lost in the wilderness. Being more of a practice game, ToL 1 is pretty short, but it should give you a nice smile and a chuckle or two! =:-) There are at least 3 endings to get, so it's worth playing more than once. Be sure to see the small readme file included with the game!